A soldier is only as good as his training and gear, and you can put your trust into the elegant Roman Soldier Helmet. The traditional design of this helm has been rebuilt to offer some modern enhancements for comfort and use. This armor was crafted from quality 18 gauge mild steel to produce a functional item. 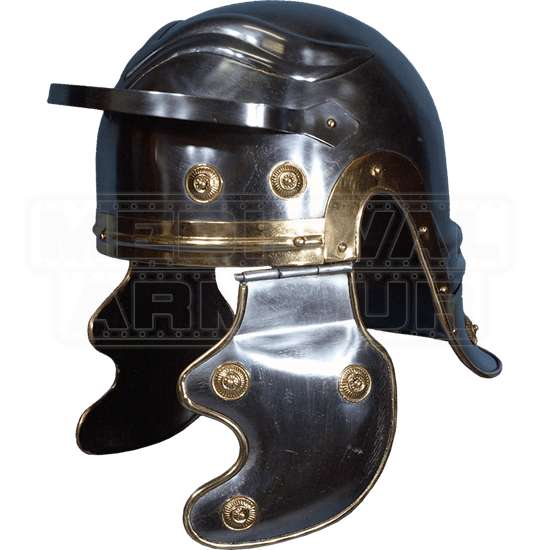 Utilized by the Roman army, this helm has an added internal liner and chin strap for comfort and proper sizing. Shown with a visor style brim, neck flap, and two cheek flaps, this piece offers true safety. The brass trim along the bottom of the helm and the brass medallions on the flaps enhance the look of this ancient armor replica. The design of the Roman Soldier Helmet offers a true balance between function and comfort, so honorably march into war with this wonderful headgear.